Thanks To Yanks will hold a Bottle and Can Drive on Saturday October 13, 2018 from 9 – 1 p.m. at the Tran Redemption Corp (Big Y’s parking lot), 161 East Main Street, Milford, MA 01757. Drop off returnable bottles and cans; we’ll sort them. All monies raised will be used to support the mission of Thanks To Yanks, including overseas care packages to deployed service members. We are also still looking for a few volunteers to help that day – anyone interested contact info@thankstoyanks.org. The 12th Annual Thanks To Yanks Tribute 9/11 Dinner was held on September 11, 2018 and full to capacity. This special non-political was a free tribute dinner recognizing all military members, veterans and their families, including Blue and Gold Star families. This event was simply a way to thank our military and emergency personnel for the sacrifices they make in order to ensure our freedoms and safety while remembering the heroes and victims of 9/11/01. 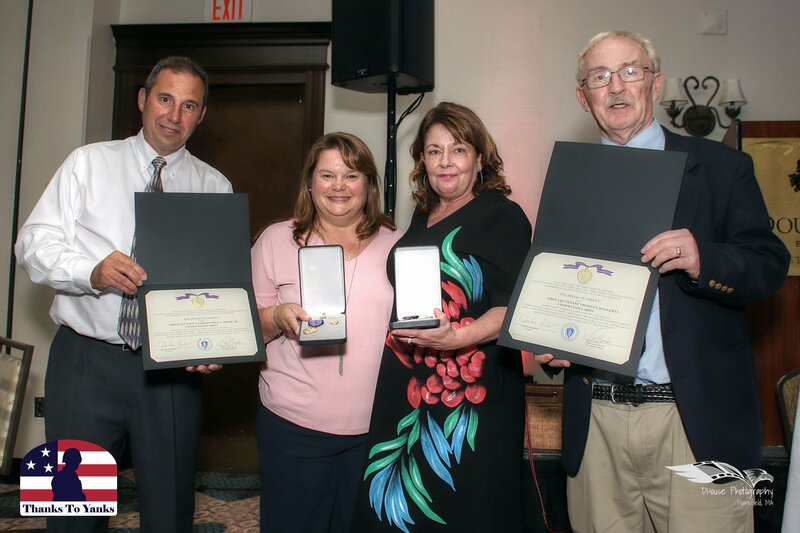 This year’s program included many great aspects, including the Medal of Liberty Ceremony, presented by Ms. Mary Connolly, Blue to Gold Liaison, Blue Star Mothers Eastern MA Chapter and Brigadier General Francis Magurn, Massachusetts National Guard Awarded to families of: 1LT Thomas Haggerty, West Harwich, MA and SFC Russell Smith, Jr., Fall River MA. Annual Walk on October 13th at 11am, at Lancer Headquarters, 1 Merchant Road, Framingham, MA 01702. A walk to benefit the Troop and Horses. $20 for individual / $40 for families.